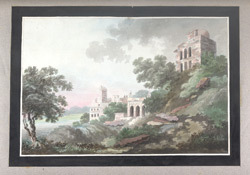 Drawing of a distant view of the exterior of the Jami Masjid and Buland Darwaza, in Fatehpur Sikri, Uttar Pradesh after William Hodges in c. 1798-1804. The palace-city complex at Fatehpur Sikri was built by Akbar (r.1556-1605), the third Mughal ruler of India, between 1571 and 1585. The Buland Darwaza is set into the south wall of the Jami Masjid. This huge gate has two inscriptions in the archway, one of which reads: 'Jesus Son of Mary (on whom be peace) said: The world is a bridge, pass over it, but build no houses on it. He who hopes for an hour may hope for eternity. The world endures but an hour. Spend it in prayer, for the rest is unseen.' The gate is approached by a flight of steps and crowned with a series of domed kiosks, or chhatris. It was probably built to commemorate Akbar's conquest of Gujarat in 1573.